Pregnancy can be a challenge for any woman, but for women suffering from type 1 diabetes, it presents a very particular set of problems. High blood sugars during pregnancy are known to quadruple the risk of birth defects, so good control prior to, and during pregnancy, is critical. The relationship between blood glucose levels and perinatal outcome has been known since the 1980s, yet the majority of diabetic women still enter pregnancy with poor blood sugar control. Given the identified risk, why are women with type 1 who want to have children not more zealous about monitoring their sugars? It’s a question I put to Melissa Ford Holloway, Chief Adviser at the charity ‘Input Diabetes’. Melissa, who is American, was diagnosed with type 1 at the age of twelve, and sixteen weeks ago, she gave birth to a healthy baby boy. Melissa explained that because the decision to have a child is so much more complicated for women with type 1, some just “don’t want to know until it happens”. The problem with a ‘blind eye’ approach to pregnancy when you are diabetic is that the first twelve weeks are a critical period in the formation of the fetal organs, and high blood sugars during the first trimester can negatively affect the baby’s development. Although women with type 1 are routinely advised to continue using contraception until their blood sugar is at a safe level for pregnancy, in the Confidential Enquiry into Maternal and Child Health: Diabetes In Pregnancy (CEMACH), fewer than half (41%) of women with diabetes had planned their pregnancy. In an ideal world, women with type one would spend months preparing for pregnancy, but here in the real world, accidents happen. Good control in the first trimester can limit the risks, but a sudden improvement in glucose levels can sometime cause the onset of retinopathy in the mother. Still, the prospect of having a baby can be an enormous motivation for women who ordinarily struggle with regulating their blood sugar and Melissa says that some of the women she speaks to say that getting pregnant literally “saved their life” because it forced them to address their uncontrolled diabetes. Melissa was a model type one mother-to-be from the start, but even she felt a twinge of resentment at having to make sacrifices for “someone she hadn’t even met yet”. She had an impressive HbA1c of 6 before she even contemplated having a child and she managed to get that down to 5.5 by the time she got pregnant. HbA1c testing measures the amount of glucose-bound haemoglobin and reflects how well blood sugar levels have been controlled over the previous 120 days. In the past a HbA1c of 7% was considered acceptable, but that figure has now been reduced to a target of 6.1% because a cohort study of 401,000 pregnancies carried out between 1996 and 2008 found that each increase of 1% in HbA1c over 6.3% was associated with a 30% increase in the odds of birth defects. The HbA1c test is helpful, but it is not an entirely accurate measure. If women have had lots of low blood sugar readings in the three months prior to testing, levels of glucose-bound haemoglobin will be lower and this can give a woman and her doctor a false sense of security. Regular finger prick tests are the only way of seeing the overall trend in control levels. Melissa maintains her tight control with the help of a continuous glucose monitor (CGM), a small device which is similar to an insulin pump. Sensors, which are attached to the skin, measure the glucose levels in the interstitial fluid – the fluid in and around the body’s cells, and a handset provides a continuous reading of changing sugar levels. Although the monitors have to be calibrated with finger prick blood glucose tests, they alarm when blood sugar gets too low, or too high, and they also show the general direction of travel for blood sugars, so users can treat potential problems more efficiently. CGM provides a much better indication of day-to-day blood sugar patterns and it can also pick up fluctuations in blood sugar levels that occur during sleep. In three-day trials of CGM, Boland et al (2001) found that most diabetes patients had experienced at least one serious blood sugar anomaly that would not have been picked up by normal glucose meter readings, or HbA1c. Research by Helen Murphy at Ipswich hospital has also shown that CGM during pregnancy is associated with improved glycemic control in the third trimester and reduced risk of complications for the baby. Given the importance of good blood sugar control during pregnancy, it seems odd that the 2015 NICE guidelines advise that diabetic women should NOT be routinely offered CGM for the duration of their pregnancy. Melissa explains that although everyone believes that CGM is a useful tool, the existing research on it is not persuasive because it was carried out several years ago using technologies that are already out of date. Because the aim is to get NICE to approve more widespread access to CGM, diabetes researchers will only push for a NICE Technology Appraisal when they can provide conclusive evidence that they are an effective way of helping diabetics achieve more stable sugars. Although it doesn’t feel like it when you are doing your seventh finger prick test of the day, the pace of change with diabetes treatments has been incredibly rapid. It is hard to believe, but in the 1980’s, finger prick tests were not even available on the NHS. By 2003, the first NICE Technology Appraisal on pump therapy had been published and today, trials of the artificial pancreas are already underway. Even so, in the UK, only 7% of adults and 20% of children with type 1 use insulin pumps, and the tiny percentage of diabetics who also have CGM are generally self-funding. Pregnant women with type 1 can ask their consultant for a continuous glucose monitor to wear during pregnancy, but whether or not they succeed in getting one depends on where they live and what hospital they attend. It is also true that not all women would benefit from the additional help a monitor would provide. When it comes to diabetes management, individual competence varies widely and additional technologies are only helpful if users are diligent and responsible. Unfortunately, a percentage of young women with type 1 diabetes purposely run their sugars high as a form of weight control, and unless they can lower their HbA1c, pregnancy is simply too risky. Because the risk of stillbirth and macrosomia (big babies) is higher in women with type 1 diabetes, obstetricians prefer to deliver babies at 38 weeks. Melissa felt a bit miffed that she wasn’t allowed to go to term, and when doctors realized that the umbilical cord was wrapped around the baby’s neck, her plans for a natural delivery went out the window too. 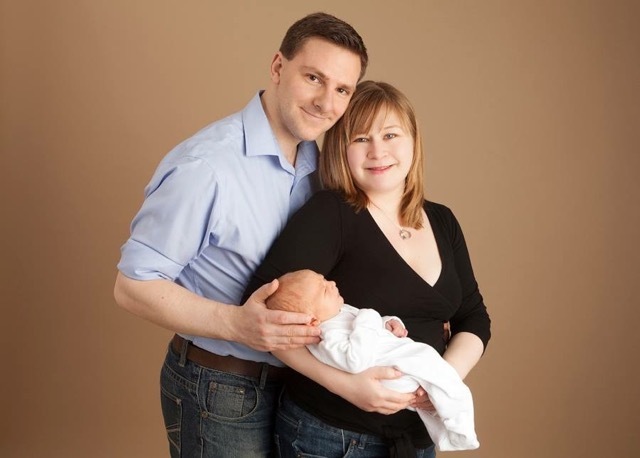 Despite having an emergency caesarean with an epidural, Melissa managed to maintain a blood glucose of 6 right through the birth, without the help of an insulin IV. Maintaining good glucose control during the birth process is important because when blood sugar is elevated during labour the baby is exposed to the sugar through the umbilicus. The baby compensates by releasing extra insulin and is then born with low blood sugar. Melissa prepared for this possibility by expressing colostrum (pre-natal breast milk) after the 37th week of pregnancy and freezing it in sterile bags just in case, but she didn’t need to use it. Her baby was born safe and well and both mother and baby were home from hospital within a couple of days. Breastfeeding is slightly more complicated for women with type one because it uses up a lot of calories and this can increase the risk of hypos. Melissa compensates by eating a little more and slightly reducing her basal insulin rate, but if her blood sugars are heading south, her CGM will alarm and she has glucose tablets stashed in every room so that she can correct hypos quickly and safely. Melissa’s experience demonstrates that it is possible to have a positive pregnancy and birth despite living with type 1 diabetes. This contrasts against a wealth of research which shows that pregnant women with type 1 have a higher level of emotional stress and anxiety, have lower self-esteem, experience greater uncertainty and ambivalence and have fewer positive expectations (York et al, 1996, Langer et al., 1998, Gray, 2001). The conflict between feeling responsible for the health of the baby, whilst struggling to control uncooperative blood sugar levels can diminish what should be one of the most joyful experiences of a woman’s life. Melissa took control of her diabetes because she was determined that it would not take control of her, but she didn’t do it alone. Her secret weapons were her continuous glucose monitor and her pump. If you are planning to get pregnant and are not yet on a pump, you should be able to get one from your clinic. You should also download and study JDRF’s pregnancy toolkit, which is packed with useful information. There is currently no funding for CGM during pregnancy, but you can self-fund. Starter kits including transmitters and receivers are in the region of £1,000, and sensors, which last about two weeks, cost £40 – £60 each. It is expensive, but a healthy baby is priceless. Photo: Richard, Melissa and James Holloway (C) Boggio Studios 2015.